With its unspoilt beaches, temperate climate and some of the best golf in the world, Algarve, on the southern coast of Portugal, has been attracting second-home buyers, whether they are searching for holiday homes or retirement residences, for decades. Algarve’s wonderfully mild climate is one of its greatest draws. Count up a total of 3,000 hours of sunshine annually, based on over 300 sunny days. With an average 12 hours of sunshine per day in summer and six hours per day even in winter, Algarve is one of the sunniest spots in Europe. Despite being on the Atlantic coast, Algarve enjoys a Mediterranean-style climate with mild winters and long, warm summers, making it an excellent year-round holiday home destination. Boasting some of the cleanest and most scenic beaches in Europe, one of Algarve’s star attractions is without doubt its stunning 200 kilometres of coastline with more than 100 beaches. Many have been awarded European Blue Flag status. These beaches are truly magnificent, ranging from secluded coves sheltered by spectacular cliffs, to vast expanses of soft, golden sand. Strict planning permission regulations secure the natural beauty of long beaches, countryside and wonderful pine forests, free of over-development. Algarve is one of Europe’s premier golf destinations, with over 40 courses, including some of the top championship courses in Europe. Expect lovely natural settings and high quality facilities. Many courses are lauded by golf professionals and champions for their excellent designs. Algarve is frequently chosen for international competitions, including the Portugal Masters, Algarve World Cup and Taça das Nações. Famous Algarve golf courses include Oceânico and The Monte Rei course, which is ranked No.1 in Portugal and 10th in Continental Europe. Other important courses are San Lorenzo, Palmares, Quinta do Lago, Vale do Lobo, Penina and Vila Sol. There are direct flights to Faro International Airport from destinations around the world, with a variety of international scheduled and charter airlines. Also, Lisbon is about two hours and 30 minutes away by the A2 motorway, while Andalusia, in Spain, is less than an hour away. Portugal offers a selection of extremely attractive investment advantages, with favourable tax regimes for new residents and special residency visa permits available for those who choose to purchase property in the country. The Non-Habitual Residents (NHR) program allows for tax exemption on almost all income from foreign sources and a flat income tax rate of 20% on the majority of revenue sources, such as salaries. As well, the Golden Visa is an attractive residence program for investors. It is aimed at investors from non-EU nations who are allowed to obtain a valid residency permit through one of several types of investments. A residency visa allows holders to enter and live in Portugal and travel freely throughout the Schengen zone. A requirement is an investment of at least €500,000 in real estate, which is reduced to €350,000 in certain urban renewal districts. Rightly labelled a prime overseas property location, the relative value and range of Algarve real estate on offer today, combined with the excellent lifestyle and climate, attractive investment advantages with favourable tax regimes and special residency visa permits, will continue to attract buyers to the region. 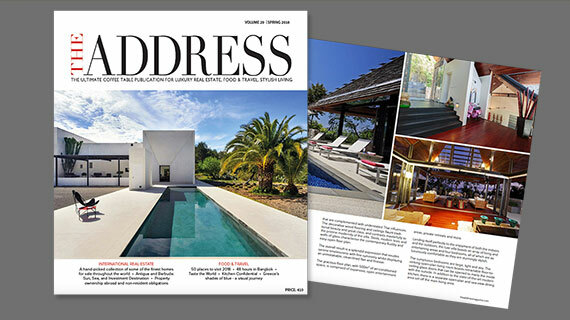 Read more about Algarve properties for sale in THE ADDRESS Magazine.